Revelator believes in cultivating meaningful experiences, and we do so by training our staff to put service first. They are committed to a culture of Southern hospitality. We work with partners to root ourselves in the communities where we operate. Each shop features food and goods from local purveyors that complement our coffee. Our coffees fit a simple, seasonal menu, and we roast them to celebrate each coffee’s unique character. Revelator is, and will always be, a work in progress. We work hard to get every detail right for our customers, and sometimes we succeed. The rest of the time, we remind ourselves that the trying is itself a source of meaning – and then we get back to work. Conveniently located coffee hot spot in the heart of Newbury street. I was able to share my Nift with a friend who accompanied me and was able to check out the location as well. Quiet spot to sit and drink some good cold brew! Good tasting coffee and well prepared beverages. Relaxing experience on a Wednesday morning! Delicious oat milk latte. Note: this is for drinks only, can't use it for food. Super friendly staff and amazing coffee! Their seating was pretty limited, but the barista I spoke to mentioned that they were getting ready for some renovations that will open the place up. Highly recommend! Latte Coffee is the best coffee in Newbury Street! Excellent and genuinely friendly service - with delicious coffee and even vegan donuts! I can’t wait to go back! The barista was super friendly and helpful! Great service here. Knowledgeable people, great coffee- thanks! Coffee was pretty good and the staff was super friendly! I enjoyed getting some information on coffee as a newbie from the barista and found just the right coffee. The store is relaxed and has a nice outside area. Highly recommended for coffee drinkers. My barista was very friendly! Amazing barista! So knowledgeable, friendly, and ready to give suggestions to a newcomer! The person who took my order was attentive and friendly. The person who made my coffee was also very attentive and friendly. Beautiful, cozy, local coffee shop in Newbury street. I just had the most amazing chai tea latter I have ever had. 5 stars for products, ambiance and customer service. Great coffee shop with sepcialty coffee on Newbury street, will come back to check out other coffee selection. Great coffee and I had a lovely scone! Barista was extremely friendly and the coffee was superb! People at the counter were very helpful. They allowed us to fine tune our gift a bit which my colleague and myself greatly appreciated. And they were knowledgable about the pastry ingredients. I would definitely recommend Wired Puppy as a 5. Great experience - I hadn't been to Wired Puppy in at least two years and walk by it every day. I will add it to my coffee/tea rotation! Friendly Barista, Flavorful iced coffee and tasty pastry. Wonderful morning treat. I'd rate it a 5 but the feature isn't working! Great service, great chocolate croissant, and great cold brew coffee! We got here somewhat early and enjoyed a quiet workspace paired with a yummy light breakfast. It got a bit busier by late morning so that took away the nice quiet vibe, but that's to be expected! I'll definitely come back. It was such a cute atmosphere and the coffee was amazing. Extremely friendly staff! Yummy pastries and exceptional coffee! Great service, great latte, great muffin! Lots of nice workspace so I was able to work comfortably. Really good, but I think they are still working out the kinks since the new owners took over. Awesome shop with great food and fantastic coffee. Cute, small coffee/pastry cafe right off the busy Newbury Street. Enjoyed my coffee and pastry, but expected there to be more options. I certainly see potential for growth with this location! Debating on how many thumbs up to give. Food and coffee was absolutely delicious. Unfortunately, the staff was not all that friendly. Also, after looking at their hours of operation online I went to the coffee shop after class at 4pm to find the door locked and all lights turned off. Originally I thought the times I had found online may have been in regards to the provincetown location, however, the sign on the door reinforced that they were supposed to be open till 5pm. The coffee was excellent, as was the raspberry danish that I had. The staff were friendly and helpful. The moment you enter their building, that smell of coffee beans sets you up for an experience. Their coffee is amazing, and the staff is friendly. Worth a visit! It would be great if they can expand their indoor seating options. I went there on Saturday 13th in the evening. My barista was very nice, i had a cappucino and ricotta and spinach pastry, both tasted amazing, thanks! Great place, but pretty crowded on a Sunday afternoon. Delicious pastries! Welcoming ambiance and awesome staff. Great cappuccino and chocolate chip cookie! It has wifi ready! It has coffee, teas, and pastries. It's a pretty simple coffee shop. I might have enjoyed more extensive food options (sandwiches or something), but for my purposes (getting some work done), it more than sufficed. The service was great and the tea and cookie tasted great. Nice staff and cozy shop! The service was extremely friendly! Very friendly staff and great coffee . very great coffee! Wish there was a place to sit! Was good! A bit confusing how to actually use the card but overall good. Excellent customer service, delicious food and drink. This was a great underground, dim-lit spot! I loved the cozy feel & funky drinks! Great shop. I'd definitely go again. 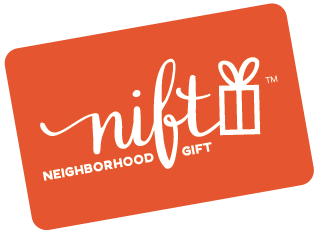 They seem to believe Nift is a good thing for them, which encourages me to use another Nift. Very friendly staff. It was a bit dark in there (especially for someone like me, who suffers from vision challenges), but otherwise a very lovely little shop! Thank you! I was impressed by how fresh the baked goods were and how friendly the staff was. I got some delicious tea and sat outside on the patio for a long time casually doing work and people watching. I am glad NIFT introduced me to this cafe. Never been in until I got this Nift! I would definitely go back! Good coffee and nice service! Great customer service! The barista was very helpful when I asked for advice on what kind of coffee to buy.